Russian President Vladimir Putin has signed a decree awarding Turkish businessman Cavit Çağlar with the Order of Friendship for his contribution in normalizing bilateral relations between Turkey and Russia following the jet downing incident in November, 2015, reports said Friday. Çağlar will be the first Turkish person to receive the order, which is given to individuals, organizations or other enterprises for a number of reasons, including strengthening peace, friendship, cooperation and mutual understanding between peoples. 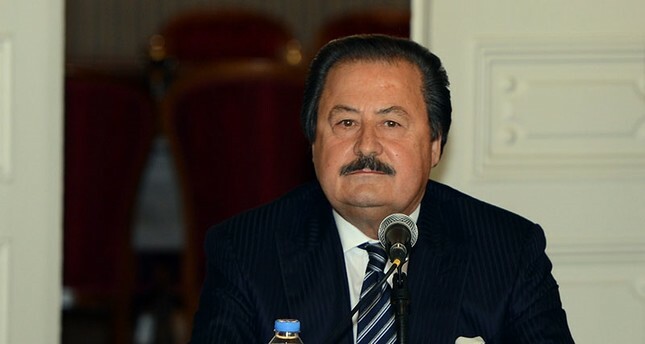 Çağlar was one of the main figures behind the normalization process, which started with a letter of condolences sent by President Recep Tayyip Erdoğan to his Russian counterpart Vladimir Putin. He accompanied Presidential Spokesperson İbrahim Kalın on the plane to deliver the letter to Putin on June 26, 2016. Russia's Order of Friendship was established in 1994 by then-President Boris Yeltsin and is considered to be the top honor that can be bestowed by Russia to foreign citizens. It is awarded for contribution to implementation of joint projects, promotion of cultural and historical heritage of Russia, for contribution to enrichment of cultures of nations and for enhancing peace, cooperation, friendship and mutual understanding between peoples, as well as charity work. Relations between the two countries hit a low in November 2015 after Turkish jets downed a Russian Su-24 bomber near the Syrian border for violating Turkish airspace. Turkey provided radar data that the Russian planes breached the border while Moscow insisted that the warplane had not crossed the border. In the beginning, Erdoğan and Putin exchanged harsh criticism and ultimatums in the wake of the jet crisis. The Kremlin directed accusations at Ankara and imposed sanctions that damaged Turkey's tourism sector. However, ties have been getting better since Erdoğan's visit to Russia in August last year. Turkey voiced regret over the unfortunate incident and the government has been taking steps to ease the tensions between the two neighbors. Besides the recovery in economic relations, Moscow and Ankara have played a key role in stopping the bloodshed in the Syrian war by agreeing on the evacuation of Aleppo in late December of last year, which was described by Putin as "the biggest humanitarian operation in the world," and subsequently established a nationwide cease-fire in war-torn Syria. Along with Iran, the two countries also took the initiative to bring together the Assad regime and the Syrian opposition in Astana to sustain a cease-fire agreement and to negotiate for a political transition in the country.